On the edge of Tanunda township on Para Road. Little Para Cottage is a little hide-away cottage in Tanunda. Just a short walk down the road to a number of wineries. There are four wineries situated along Para Road in Tanunda and Little Para Cottage is the closest accommodation to them all! Tucked away at the rear of a half acre block on the edge of the township, this is a hide-away cottage built for two. 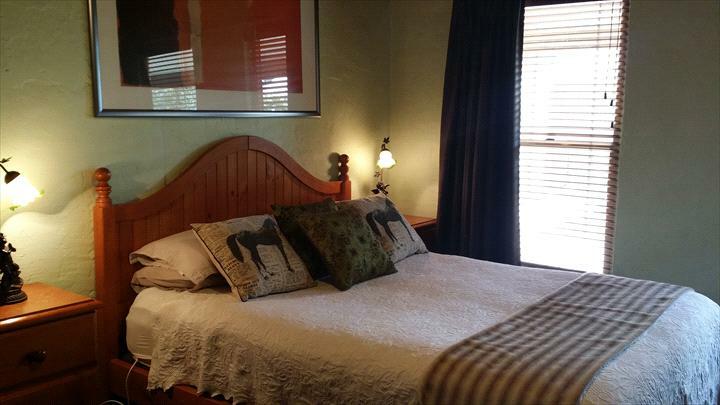 It's little - just one cosy bedroom - but self-contained with kitchenette and ensuite bathroom. Ideal for short or long term stays with all the comfort of home! Private undercover off-street parking is provided and guests have their own entry and fully fenced garden area. The rustic garden setting is so tranquil! For your convenience, there's also a hotel and bakery in walking distance and you can go for a stroll to buy the morning paper. Enjoy a vineyard walk on the nearby walking trail that weaves past huge gum trees in front of Peter Lehmann Wines. Laundromat nearby if required. You'll love it! 1 queen bed, separate lounge/dining/kitchen area. Tea and coffee making facilities. Ensuite bathroom with shower, air conditioning, TV/DVD player with Foxtel, Ipod dock/Clock Radio, CD/Ipod Player. Breakfast not included. All service changes/cancellations will be subject to a minimum $50 AUD cancellation fee. Full payment is due for bookings within 30 days of arrival date; failure to arrange payment will result in cancellation of the booking. Cancellations notified 30 days or less prior to arrival date and where the guest has entered an agreement to make final payment on the day of arrival the guest remains liable for the full payment. Payment will be invoiced to the guest and / or charged to any security held by this service. Cancellations notified 30 days or less prior to arrival date will forfeit the full deposit / money paid. When a booking has been made 30 days or less prior to arrival date and cancelled the full deposit / money paid will be forfeited. DAMAGES / SMOKING / CLEANING POLICY All services booked through Accommodation Getaways Reservation Service are subject to an accidental / willful damage policy a no smoking policy and an excess cleaning policy. Where the individual services confront interruption to business or unreasonable delay and expense in business operations the responsible guest will be charged accordingly.